Form 667B. Issued in October 1940. This lists the kit issued to this airman, Sgt. Hartwell. It included 1939 pattern boots, Type B helmet, 1933 pattern gauntlets plus silk liners, 1930 pattern suit, liner and collar, MK.IIIA goggles, B-type (late designation number), D-mask with type E assembly, face protectors and so on. Later in 1941/2 he was issued a revolver, Taylor buouyancy suit, electrically heated gauntlets, suits aircrew blouse, frock white and so on. Interesting to note that he didn't get an Irvin until 1943. 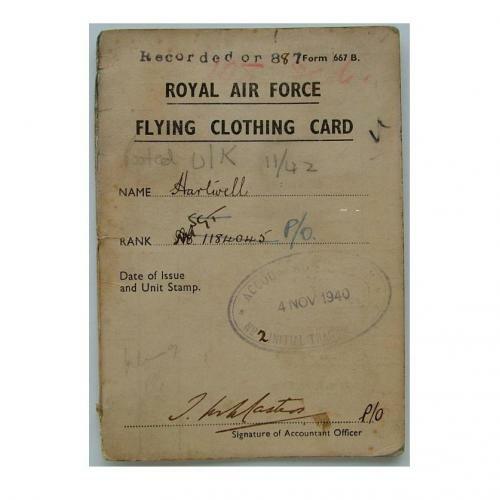 A fascinating insight into the kit issued at the end of 1940 until the mid-war period. Good used. Stock code P21685.